Ya know, I program a lot. I also create a lot of web sites. So, having a good text editor is kind of essential. For the longest time, I’ve been searching for a good programmer text editor like TextMate. Unfortunately, I shun Macs like the plague since I can build better, faster, more reliable puters myself for 1/3 the price, so TextMate wasn’t an option. And I most certainly will not run a hacked version of OS X just to get TextMate! At first, I used jEdit. It’s okay, but not quite what I was looking for. Then, I switched to NetBeans for my Ruby on Rails stuff, and Notepad++ for everything else. Well, that worked okay, but NetBeans RoR support is pretty lacking these days. Furthermore, I wanted to get the heck away from these darn Java-based text editors. That’s really just silly. You can think of Sublime Text as “TextMate for the rest of us – on steroids”. Since ST2 has been out for awhile now, and I had never even heard of it, I figured I better post about it and let everybody know! Not only can you use it for free, but it runs on Windows, Linux, and OS X. Nice! Of course, you really should buy a license for $59 if you keep it. Considering what you get, $59 is cheap! If you need multiple licenses, the cost per license drops. To get an idea of what Sublime Text can do, it’s best to just visit the Sublime Text homepage. Drag and Drop, of course! For more info on how to use this fabulous editor, see the unofficial documentation. Or, just play around with the menus and options. I’m still learning all the keystrokes and shortcuts. And, that’s part of the fun: I want an editor that is designed for programmers, but I don’t want vi, vim, emacs, or any of those old-school editors that, while useful and powerful, often have massive learning curves and aren’t exactly user-friendly. 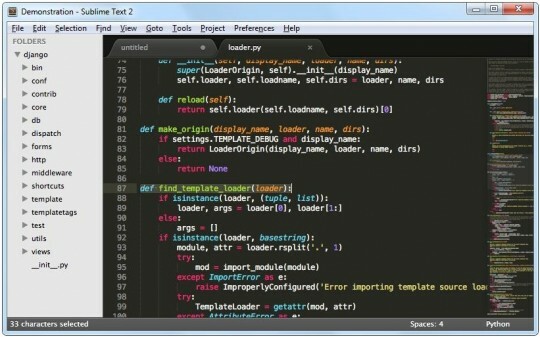 For me, Sublime Text 2 is the perfect solution. I get the power-user stuff and the friendly UI and extra fancy features. Lemme tell ya: I LOVE the Minimap. Say goodbye to scrolling through long files. I can leave the cursor in one part of the file, jump down and examine code in another part, and then instantly jump back to where I was. Very cool! I dunno about you, but I bought me a license already. The multi-line edit feature has already saved me tons of time! You can download Sublime Text 2 here, and you can buy a license key here. I still keep Notepad++ around for my general purpose text editing needs since it is far, far better than Notepad or WordPad. 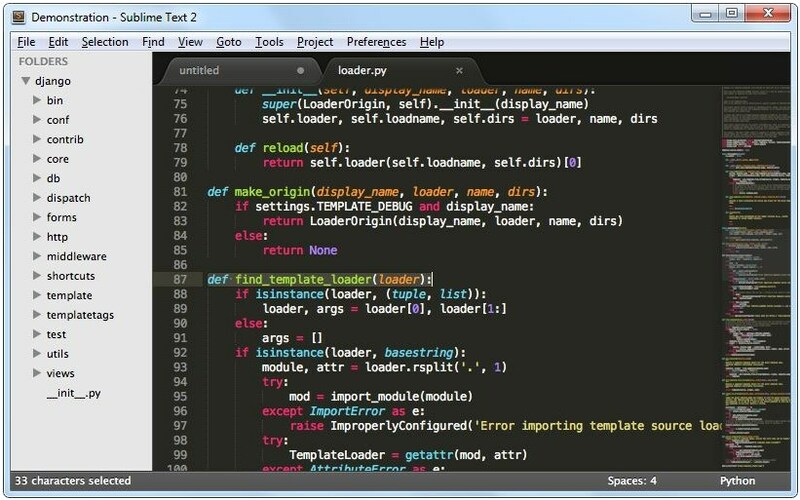 I just downloaded Sublime Text 2 on your recommendation, and I’m impressed! It’s got the features I’ve been looking for for years. The context display in the multi-file search result is especially nice when you want to find all the occurrences of a function call where the arguments to the function are broken up on to separate lines and you need to see those arguments. Very cool. Thanks for the heads-up. I use a mac every day with TextMate for development and have done for the last five years mainly for developing websites. I tried ST2 and even bought a license as I feel the project deserves support, while I really like ST2 and use it for PHP projects I find the lack of rails support keeps me jumping back to TM. I have installed the package manager along with a number of 3rd party packages like erb etc but compared to the built in rails bundle in TM, I feel ST2 is lacking. One of the things that bugs me is the lack of tab completion, in ST2 typing if+tab gives me a php if block? but I’m editing a rails erb file. Given that ST2 uses TM bundles these things should really just work out of the box. Also while I like the fact that users can write their own extensions etc I personally have zero interest in messing around with the editor, Its a tool like a hammer and I just want it to work so I can code the applications I’m being paid to work on. Also I’d rather not have to rely on the community as there is no way of knowing the quality of each of the extensions without trawling through the code, again not something I want to do. Like scott I use these tools almost every day and to be honest I’d rather pay a little more and not have to spend hours setting up and configuring my editor. I’m hoping that ST2 matures and becomes the editor I can use for all my projects.